Last time when we went out for dinner, we tried out a gravy called Makhanwale Sabzi, and we loved it. I decided to try it out at home, guessed the ingredients and spices, and the result was- a new post to this blog ! An interesting recipe for cheese lovers like me. 2 Cups chopped vegetables like beans, carrot, potatoes, and cauliflower. In a pan, heat a spoon of oil, and saute ginger, onion and tomatoes. Cook for a minute. In another pan, heat butter, and add cornflour, mix well such that there are no lumps. Now transfer the cooked ginger, onion and tomatoes to this cornflour, and mix well. Add milk, salt, jeera powder and pepper powder and let it simmer for a while. The gravy thickens after a while. Now add the steamed vegetables. 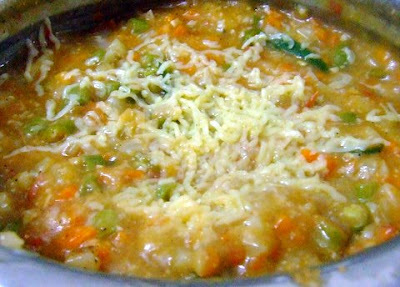 Just before serving, garnish with grated cheese. Great combo for rotis or rice.